MICHELLE YOZZO DRAKE - MEDIA PERSONALITY! Michelle Yozzo Drake is no stranger to being in front of - and behind - the microphone! Listen to Michelle as a guest expert! 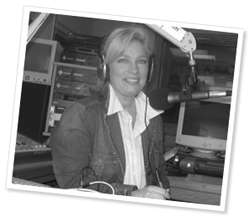 Hear sample recordings of Michelle's radio show "Workplace Wisdom!" As a guest expert in communication, career advancement and leadership, Michelle has appeared on numerous radio shows across the country to share her insights and advice for success on a variety of topics. She also hosted a popular radio show on WXCT Talk Radio 990 AM every Thursday morning at 9 a.m. "Workplace Wisdom with Michelle Yozzo Drake" was a power-packed hour of business tools and tips from Michelle herself and the wide array of business luminaries she interviewed, including Andy Boynton Dean of the Carroll School of Management, Kim Kiyosaki author of Rich Woman: A Book on Investing for Women, Judith Glaser author of The DNA of Leadership, and many more. Visit the SHOP page for incredible audio products from Michelle Yozzo Drake! Vicki Flaugher of SmartWomanGuides.com interviews author, professional speaker, and executive coach Michelle Yozzo Drake on stories from Michelle's new book, "From the Kitchen to the Corner Office: Mom's Wisdom on Leadership", and her exciting upcoming event LIPSTICK LEADERSHIP WEEK, July 14-18, 2008 *July 28th through August 1st, 2008! *Due to an overwhelming volume of responses, we've extended the deadline to submit "Mom's wisdom" stories! "Lipstick Leadership Week" has been rescheduled for July 28th through August 1st, 2008! Kathryn Zox, "your social worker with a microphone," interviews Michelle Yozzo Drake on her exciting new book, "From the Kitchen to the Corner Office: Mom's Wisdom on Leadership." It's time to give women - and the feminine perspective - the recognition and respect it deserves - and that's exactly what this guidebook to applying "mom's wisdom" in the workplace does! Dr. Alvin Augustus Jones of The Paradise Radio Network (WCBQ-AM 1340, WHNC-AM 890 in North Carolina) interviews author Michelle Yozzo Drake about her new book "From the Kitchen to the Corner Office: Mom's Wisdom on Leadership." The two discuss her extraordinary mother, Ann "Mimi" Yozzo, and how her enthusiastic, faith-filled approach to life has helped Michelle find the positive even in the face of adversity and tragedy. Michelle also recounts the other incredible women in her life and the vital lessons they've imparted on her that have contributed to her personal and professional success - the very same lessons presented in "From the Kitchen." During this segment of "Dr. Carole's Couch", Dr. Carole and Michelle Yozzo Drake discuss why the Presidential candidates should listen to their mothers! An expert on "Mom's wisdom," Michelle offers her insights into the powerful impact the simple truths our female role models teach us and how they can be applied in our professional lives for success - this concept is the premise of her new book "From the Kitchen to the Corner Office: Mom's Wisdom on Leadership." "Work Matters with Nan Russell" on webtalkradio.com features Michelle as a guest expert to discuss how to take complex projects (and big goals), build super teams, and break everything down into management and efficient parts. Michelle also shares the tools for success she has received from all areas of her life. Michelle Yozzo Drake appears on Greenstone Media's "Women Aloud" show featuring Mo Gaffney and Shana Wride. In this segment, Dr. Jonny Bowden fills in for the ladies and interviews Michelle on her best tips on asking for - and getting - a raise. Do you have what it takes to start your own business? Find out by listening to Michelle as she makes a guest expert appearance on "Reach for Your Dreams" with Courtney Kelley on Providence's Talk Radio 920 WHJJ. Morning News Focus on KOTA Radio 1380 AM in Rapid City, SD invited Michelle to share her insights into the "Stupid Reasons People Leave Their Jobs". This interesting and entertaining segment is food for thought for everyone out there contemplating quitting their jobs. Michelle joins successful New York interior designer, broadcaster and author Natalie Weinstein on Ms. Weinstein's weekly radio show "The Home Show with Natalie Weinstein" on WALK 1370 AM to discuss their advice for home-based businesses. A Long Island native, Michelle returned to appear as a guest on the "In the Morning with Bonnie Grice" show on NPR's WLIU 88.3 FM. Michelle and host Bonnie Grice discussed the integration of business into the art scene and how artists can maintain their creativity while being financially successful at their craft. Move the timer to 32:45 to listen to Michelle's segment of this show. At the request of NEW: Network for Empowering Women founder Christine Kloser, Michelle appears as the "on-call expert" for their monthly virtual meeting. She engages the network with a discussion on "promoting your passion with passion." Back by popular demand, Michelle appeared again as a guest on the �Vital Women� radio show hosted by Donna Mac on 96.1 WSRS. Hear Michelle and Ms. Mac chat about Michelle�s latest Cove Health facility project as well as some of the topics Michelle will be addressing in her upcoming book. Charlie Profit, host of the �Impact� program on Talk Radio 990 interviews Michelle about the launch of her exciting new radio show, "The Time is NOW: Business Solutions with Michelle Y. Drake," airing on Thursday mornings at 9 a.m. on WXCT Talk Radio 990 AM. Donna Mac, host of the �Vital Women� program on Coast 93.3, interviews Michelle after the completion of Michelle�s successful Women�s Leadership Symposium . Listen as they discuss the topics of women as leaders and Michelle�s own sources of inspiration. "Navigating the Classifieds Jungle: Job-Hunt.org"
Searching for a job can be one of the most frustrating, isolating times in your life - especially if you have no idea how to do it right. Unless we change jobs every month, we're all out of practice and have to start over every single time our career path takes a different turn. Enter Job-Hunt.org! Editor Susan Joyce joins Michelle to discuss her website job-hunt.org, a top-rated employment gateway that's more than just job information. The site boasts links to over 8,700 resources (including over 5,000 employers) organized by state for job seekers as well as articles by "Job Hunt Pros" - experts on interviewing, resumes, and more - and its most unique feature: job search supports groups and associations that wipe out the loneliness of the job hunt. Ms. Joyce also reveals The Most Dangerous Internet Job Hunting Assumptions and her tips on easing the pain of the job search and innovative ways to get networking! To start your job search today, visit Job-Hunt.org today. "Women Helping Women II: Perspectives from The Conference Board's Women's Leadership Summit"
We HAVE come a long way, baby, but not far enough to completely level the workplace playing field between men and women. Perhaps future generations of women will enter a workforce where equal pay and equal opportunities will be present for both the sexes, but until then, we are fortunate that there are strong women leaders and organizations out there focused on helping women rise to the top of the business world. The Conference Board and their Women's Leadership Summit is one such organization. Michelle had the privilege to interview the Summit Director Mary Wright Benner as well as Summit speaker Carol Fishman Cohen. Ms. Benner shares the history of The Conference Board, the goals of the Summit and its attendees, and the responsibility of women to fight for solutions to their issues in the workplace. In the "Lipstick Leadership" segment, she describes the female influences in her own life and how being a mother has shaped and enriched her role in the workplace. Ms. Cohen - co-author of Back on the Career Track: A Guide for Stay-at-Home Moms Who Want to Return to Work - discusses the experiences that led her and her co-author to create this insightful guide. She also reveals four companies that boast stellar in-house programs designed to assist in the re-launch of careers for people who've been out of the workforce for an extended period of time. For more information on The Conference Board and its programs, please visit Conference-Board.org. "Women Helping Women I: Perspectives from Bryant University's Women's Summit"
"10 Years of Success: Celebrating Women and Business" was the theme of this year's Women's Summit at Bryant University, and Michelle had the honor of interviewing Summit Director Kati Machtley, session speaker Nancy DeViney, and keynote speaker Tory Johnson. In her segment of the show, Kati Machtley explained the origins and history of the Women's Summit and the significance of it in the lives of the women who attend each year. Nancy DeViney - Vice President of Culture and Leadership Behaviors and Client Value Initiative at IBM Corporation - delves into how women can make global connections through mentoring and networking. She also reveals the Top 5 Biggest Issues Women Face in the Workplace and the female role models in her own life. Tory Johnson - CEO of Women for Hire and author of the book Take This Book To Work: How to Ask For (and Get) Money, Fulfillment and Advancement - uncovers the #1 obstacle that holds women back from "the ask" and how to overcome it, as well as her top tip for advancing your career. More information on this year's Summit can be found at Bryant University Women's Summit.